Class, eh?And yet - not one of the Quartetto's best albums, to be honest. Still, I think it's well worth hearing - this is a wonderful repertoire, which I've been collecting and enjoying on CD for years, and now I'm often finding that musicians of the 1950s and even earlier made some very honourable stabs at it. I've tried to identify all the pieces but I got lazy with Vitali's Capriccio - if anyone can pin-point that (or confirm that this is Neri's Sonata quinta from Op.2*) I'll be... less grumpy than usual. Michael Gray's data (http://www.charm.kcl.ac.uk/) gives a recording date only for the items on side 1 (and the Italian LP number); I've assumed side 2 was recorded the same day. 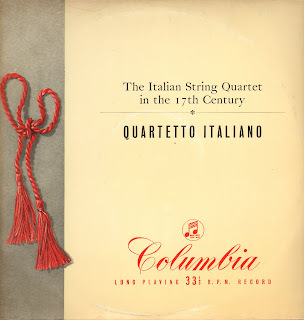 Talking of the Italian issue, the Quartetto's own very useful website gives the date of April 1957, which must be the release date, as well as the entire original Italian sleeve note by Luigi Pestalozza. I hope you can make out Columbia's translation in my scan, and also the section titles: each piece is one file but three consist of more than one section. In fact two aren't quite right here: the Marini apparently goes (a) Entrata grave (b) Balletto allegro (c) Gagliarda (d) Corrente (e) Retirata (so my Manze CD says); and the Vivaldi should be (a) Largo molto (b) Allegro ma poco andante. Should I give recordings away free? This one, yes: I've done nothing beyond the usual ClickRepair and the condition of side 2 was not quite what I was led to believe by the seller, so there's quite a bit of shushy noise in the Vitali and some clunks in the Vivaldi. (Also, are my dubs getting worse or what?) But I have a couple of other LPs of this type which are rarer and musically more rewarding. If academic work is not forthcoming after I finish my Phd (if I ever do...) and even if it is, I'd like to make a living in this reissues racket; if these guys can do it, why not me? First, thanks for the Italian Quartet LP. When I was at school, a friend's father used to have this LP and I loved it. I'm sure it's wonderfully unauthentic, but I can't wait to hear it again. Second, charging for your work. Yes, up to a point, though I think you'll need to choose your repertory very carefully and charge sensibly - I can't believe that Forgotten Records are going to get many takers for grotty old French LPs at £12 a throw. It really depends on what you have available, or can obtain. Two areas that seem to have been largely neglected, both from the 1950s are Concert Hall Record Club (the US version) and MGM (ditto) - all sorts of fascinating things that have never been reissued. And closer to home, the Nixa catalogue, although, of course, much of this was sourced from the US, and World Record Club - some fascinating things amongst the early issues. You gotta do what you gotta do. Thanks for what you've given us here, and elsewhere, and an especially HUGE thanks for the CHARM archive! I've thoroughly enjoyed the Boyd Neel offerings!! With so much music available free on the Net (including rare Lp transfers), I think you'd be better off spending your time on getting some peer-reviewed papers published by the time you go on the market as a freshly minted PhD. If all else fails academic-wise, I'd bet you'd make more money tutoring or writing term papers for lazy undergrads than trying to sell Lp transfers online. This, of course, is a highly subjective point of view, but it is informed by both first-hand knowledge of academic job market situation and first-hand knowledge of what's available online music wise. Thanks, Boom - I was reluctantly coming to the same conclusion!